Kenny Roberts was the first road racer to introduce the concept of getting your "knee down" on the track. Marc Marquez looks like the first to amp that up to getting your "elbow down" in recent weeks. These talented riders push the limits of technology, particularly the research and development behind tires. While we'll never have a level of MotoGP advantage in an off-the-shelf tire, each progression at the pro level passes down a bit more stick from track to street. Into the limelight, the Dunlop Sportmax Q3 Tire emerges! This iteration of the Sportmax Tire includes Dunlop's Carbon Fiber Technology (CFT) along the tire sidewalls. This gives a boost to corner performance and edge grip, while maintaining an exceptional feel. 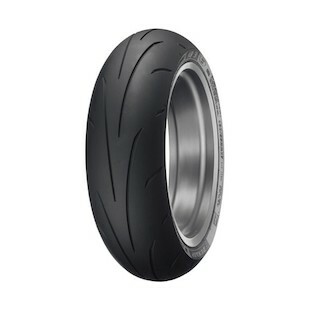 The Sportmax Q3 tire compounds have been updated to produce maximum sport riding performance. 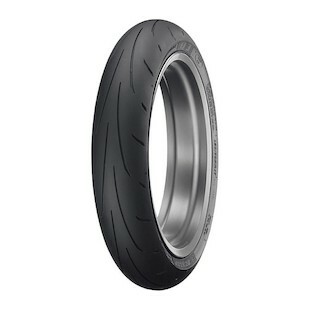 Added on top of the Intuitive Response Profile (IRP) that we saw in their Dunlop Q2 model, the Dunlop Q3 takes the best of your racing skills and responds quickly and smoothly in a predictable fashion. While we would classify the Q3 mostly as a track day tire due to the reduction in grooves along the tread, the tread placement and groove length improve wet-weather performance over the Q2. Multi-Tread technology in the rear does give better tread life for road use while still keeping excellent lateral grip compounds at the edges. However, in the unpredictable conditions of street use, we would advise that you will get the most out this tire at the track. The Dunlop Q3 Sportmax Tire gives no guarantee of getting your elbow down at the track, but the advancements in technology bring us one step closer to feeling like Marquez.